One of the best setup men in the National League more than doubled his salary today. The Astros and Dan Wheeler reached an agreement for one year, $2.1 million dollars today, avoiding arbitration. Wheeler, who was acquired on 27 August 2004 from the New York Mets for minor leaguer Adam Seuss, made an immediate impact in his very first game as an Astro by hitting Derek Lee of the Chicago Cubs in the back as retaliation for the beanings of Berkman and Beltran earlier in the game and indicative of the acrimony created by Michael Barrett earlier in the week. That game also changed the fortunes of the Houston Astros and they were well on their way to their miracle 36-10 run which ultimately culminated in the Astros winning the wild card and the first playoff series in their history by beating the Atlanta Braves. Dan Wheeler was an instant hero in Houston that day and over the past two years has certainly done nothing to change that perception. In 2005, Wheeler had an impressive ERA of 2.21 with a WHIP of 0.982 in 71 games and 73.1 innings pitched. 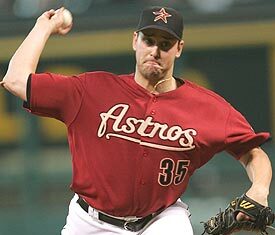 In 2006, "Wheels" was one of the few relievers the Astros could count on, pitching in 75 games and 71.1 innings with an ERA of 2.52, WHIP of 1.150–this after skipping part of spring training to participate in the inaugural World Baseball Classic. Big Puma’s going to be on Astroline tomorrow at 7pm.. I’m eagerly waiting for your recap =). Hopefully I’ll remember to listen; I’m sure it will be enjoyable. He sure is! I’m going to try to call in. Figured going there is not really worth it because it will be very crowded and you can’t really hear too well if you get stuck in the back. I actually listened last night… They really need to screen callers better… why would they let someone waste Berkman’s time by asking “if” Pettitte is going to come back. Come on! Berkman’s a class act though. There probably isn’t a better person/personality in baseball. I agree..I was totally disgusted by the calls they took…between the goo-goo ga-ga women and bandwagon men, it was almost pathetic. I did like the little kid though…he was cute and asked an intelligent question. Yea, unfortunately the kid was hard to understand.